If you have watched Schindler’s List, you should watch this. May this music cheer you up! 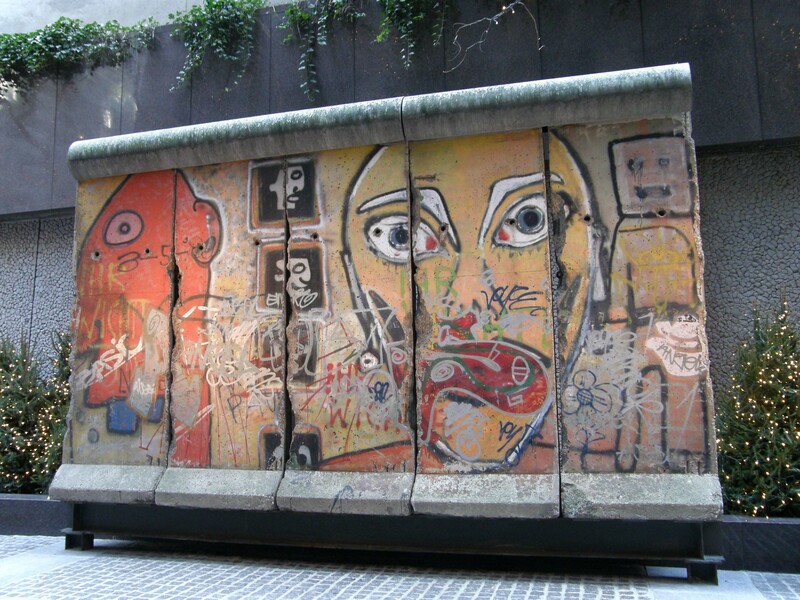 There is a piece of Berlin Wall on 53rd Street between Madison and Fifth Avenue of Manhattan. The wall is 12 feet tall, 20 feet wide, and consists of five panels. From 1961 to 1989, it sat on the border of East and West Berlin, watching the madness of people at play. In 1990, this piece of wall reincarnated into a mural at one corner of New York City’s busy streets. Many people walked by without noticing it. The employees in the buildings nearby sometimes sit beside it to have lunch, and the tourists looking for the “big spots” almost never stop here. So the wall watches on, perhaps singing “oh when will they ever learn” to itself. The mini park next to the wall is a perfect place for meditation. Sit still, and you’ll discover something, or about the benefit of nothing.